Deciding on the right IBC for the job can be more complicated than originally thought. There are a number of variables and variations that can be included to suit client specific needs. 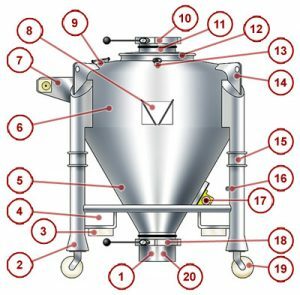 We can guide you through this process and offer you the perfect IBC Container that will fulfill all your expectations. Pneumatic conveyors and vacuum feed wand holders were used to transfer dry food materials from Gaylords to various process systems. Using dense phase conveying and a large flapper valve as the discharge feeder, we were able to transfer the different and delicate products without damage.